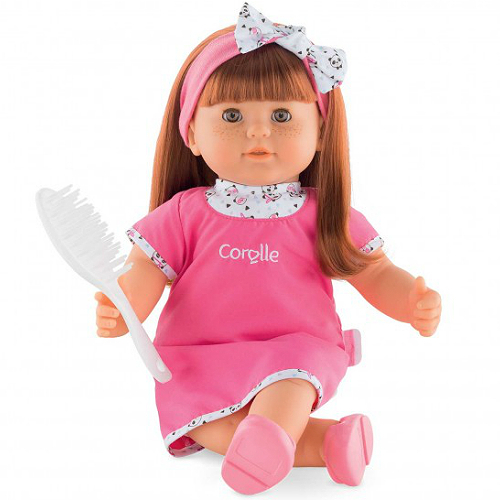 Ambre is a beautiful Corolle doll with red hair and freckles on her face. She is the perfect larger baby doll for those ready for a more substantial doll yet sized just right for mothering and cuddling. Your child can comb her hair and style it using Ambre's special hairbrush. Her face, arms and legs are made of delicately vanilla scented vinyl and her body is soft. Ambre has brown sleeping eyes which close when she is put on her back. She comes dressed in a pink dress, matching headband and pink shoes. 14" tall. Measures approximately: 9.25 x 15.75 x 5.75 inches.. In Greenwich, CT for 29 years. 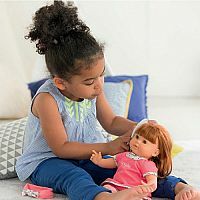 © 2019 Specialty Toys Network, © 2019 Smart Kids Toys or its affiliates. All Rights Reserved.